The next best thing to living in the city's finest apartment building is having it as your neighbor across the street. The River House (see The City Review article) with its gated driveway is directly across from this very handsome apartment building on this quiet, dignified, dead-end street that overlooks the East River. This distinguished, 11-story building does not overlook the river as there is one more narrow building on its side of the street to the east, but it is the most interesting looking building on the block with a rather spectacular arched roofline topped with pelican finials. (The River House, of course, is much larger, grander and more impressive.) This building is similar in its massing and palette to the several other very attractive, mid-block apartment buildings on the same side of the street, but they were developed separately and sport an Art Deco-style architectural treatment whereas this building is more eclectic in its asymmetrical and quite vigorous architecture accented by several decorative piers. The red-brick building was erected in 1929. It is a cooperative and has 52 apartments. It has a rusticated one-story base, a canopied entrance, quoins, consistent multi-paned fenestration and very fine decorative details. It permits protruding air-conditioners and jas no health club, no sidewalk landscaping, no balconies and no garage. 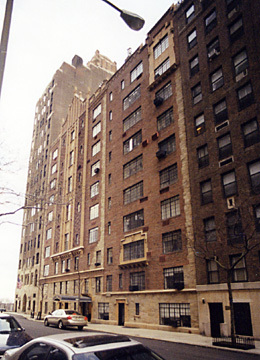 Midway between Sutton Place and Beekman Place, the building is not far from the United Nations and there are numerous restaurants in the area. There is a fair bit of traffic on this block because cars have to turn around on the dead-end street. There is cross-town bus service on 57th Street and 49th and 50th Streets. The building is not close to subways.